Norman H. Sutcliffe was born in a small village in Leeds in 1935. His father was a Methodist Minister and Norman’s childhood was spent moving around with his father’s work. After several moves within the north of England the family then found themselves in London. Norman recalls he found London difficult to adjust to and he was not sorry to move out to Essex. In the late 1950s the family settled in Leigh on Sea when Norman’s father was invited to take charge of the Methodist Church in Elm Road. During this time Norman did not spend much time at the family home, having attended medical school he was often away training at various different hospitals. 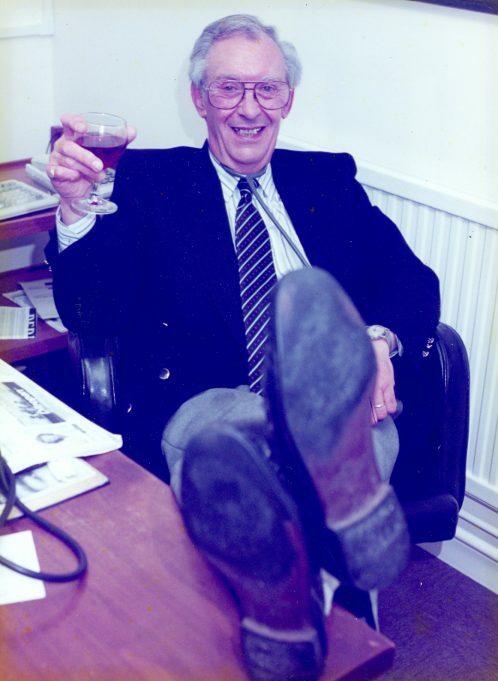 Norman qualified as a General Practitioner in 1959 and later, in 1961 he found work at a small practice in Thundersley. He joined Dr Douglas Acres, Dr Vincent Tyndall, Dr Ralph Taylor and Dr Tom Wilks. In the same year Norman married his wife, Jan and they went on to raise their family, two sons and a daughter. In 1961 when Norman joined the practice, Tom Wilks was already approaching 70 years old and retirement beckoned. Tom had been the local doctor for many years and was renowned in the area for arriving on horse back when he visited his patients. Larger than life and an ex-army doctor, he had served in the Cavalry as a medical officer during the war. An accomplished horse rider, he had two horses which he rode regularly around the un-made roads of Benfleet. In later years when Tom could no longer ride, Norman helped Tom’s wife Frankie exercising the horses and the pair could be found riding the local unmade roads. Norman has recorded some of his memories of his days at the surgery but explains that when he retired in 1993, he was somewhat relieved as the new technology was difficult to adapt to. However, he says that he was very sorry to leave his patients behind, as they felt like family to him. Today, Norman lives in Leigh-on-Sea with his wife Jan.
Click on the sound recordings to listen to Norman’s memories. 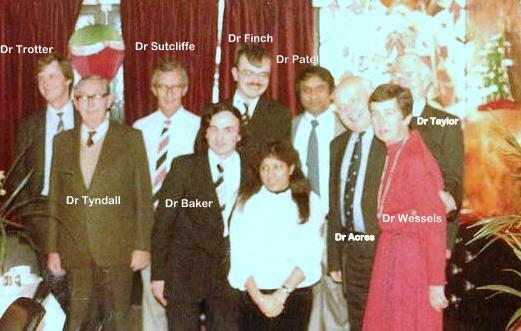 Doctors from the Rushbottom Lane Surgery celebrating the retirement of Dr Doug Acres in 1983. Norman talks about Pendley House practice at Tarpots and the Kiln Road surgery. Approx 6min 30sec. The changes after Tom Wilks retired. The arrival of Dr John Clarke and Dr Helen Wessels. Approx. 2min 10sec. Description of the local area. A home birth visit when many local roads were still unmade. Approx. 2min. Norman's memories of working with Tom. Approx 2mins. The modern practice with the advent of computers. How computers changed the work of a G.P. Approx 2min 10sec. Home visits made by Norman. I worked as a Receptionist/Secretary for Dr. Sutcliffe in the late sixties and have many memories of those times. Dr. Sutcliffe was such a kind and understanding man for whom I had great respect. I also used to occasionally babysit for his three children. It was lovely to hear him recounting his memories. I have to say I have had many jobs over the years, some in management, however I remember my time at the surgery with great fondness and still have my job reference written by Dr. Taylor to this day. Many thanks for the kindness and understanding shown to me during the years I worked at the practice. Heather Jaggard-Legerton – formerly Daly. Dr Sutcliffe was my family doctor from 1963 until I moved to the other side of Benfleet in 1986. He saved my brother Peter’s life when Southend Hospital sent him home having missed his ruptured spleen and Dr Sutcliffe sent him back. A top man indeed. Dr Sutcliffe was my doctor from 1968 until he retired, he was the best Dr I had and helped diagnose my daughter Melanie with Asthma, he also had to put up with my brother Kenny who got to know him well. Sadly Ken died, age 52, 10yrs ago, my dad has gone also but my mum is ok age 84 now. Thank you for being such a kind doctor. I joined the surgery as a receptionist 1970. It was my first job on leaving school and quite an experience!! One of my most important duties was going to the baker’s each day to get Norman’s roll for lunch. I remained at the surgery for 7 years – a very happy time. I also use to babysit Norman & Jan’s 3 children. Thank you Marina I remember you well. You were such a brave little girl it was a privilege to treat you and your family. Fantastic! Really nice trip down memory lane, a great page. Thank you. Dr. Vincent F. Tyndall M.B. CHB.